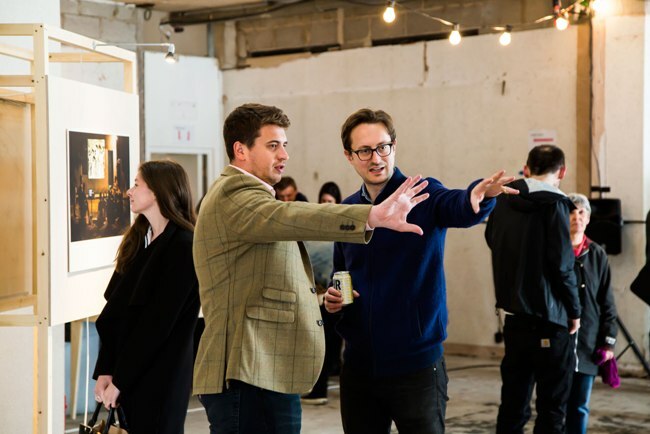 Leeds-based arts organisation, East Street Arts, has teamed up with LJ Real Estate as part of an exciting collaboration bringing a new immersive pop-up art space to Leeds. 34 Boar Lane opened last Saturday and is a making, showing and social space for artists and the public, located on the iconic city centre street for a six month period. The wider building is currently being developed by LJ Real Estate. The space will host digital and audiovisual (AV) artists, designers, and socially engaged artists, with a key focus on food and art, and is based in and around a series of specially designed wooden studio pods. 34 Boar Lane will house a wide range of workshops, exhibitions and events, including Digital Natives as part of Leeds International Festival and Mr Arkwright’s Food Emporium, a collaboration between artist Helen Russell Brown, The Real Junk Food Project and creative chef, Andy Castle from Ox Club as part of Leeds Indie Food Festival. Mr Arkwright’s Food Emporium will bring the waste food revolution into popular dining with a series of creative waste food dining experiences. The creative space will also incorporate Poor Image Projects (PIP), a new artist-led initiative which supports both artists and non-artists to experiment with audio visual tools. LJ Real Estate has worked with the young, collaborative architectural practice, Studio Bark to develop five sustainably produced, wooden pods to operate as art studios and workshops in the space. Using an innovative ‘u-build’ system, the artists who will take up residency of the space helped to build their own studios.